Ultra-powerful, the FyrePower Alpine gas stove is an ideal cooking companion for more extreme adventures. With a ‘spider stove’ design that sits close to the ground for maximum stability, the FyrePower Alpine features an impressive 3,800W output for fast boil times. 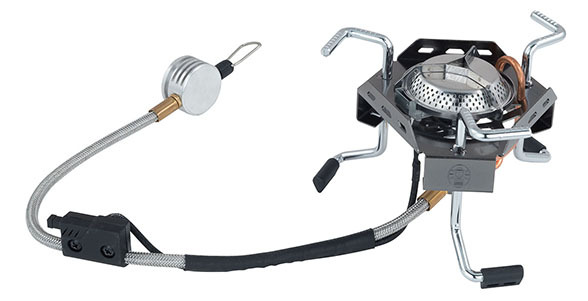 The extra-long, flexible metal hose makes the stove easy to use with larger cartridges and piezo ignition offers easy lighting. Designed with our latest burner technology, the FyrePower Alpine offers outstanding real-life conditions thanks to integrated wind baffles. Weighing just 320 g, the stove won’t weigh your pack down and comes with a protective carry bag. The stove’s feet and pan supports are spring loaded, making it easy to store compactly. The FyrePower Alpine is compatible with Coleman Xtreme Gas and Performance Gas cartridges. Features: Feet / Pan supports with spring lock system, allowing compact storage. Extra long flexible metal hose with piezo allows a flexible positioning of the cartridge and a matchless ignition. Cross on burner serves as wind baffle.